Earn $11.49 in Rewards credit (1149 points) What's This? The Commuter 4 is the right choice for all your outdoor adventures. 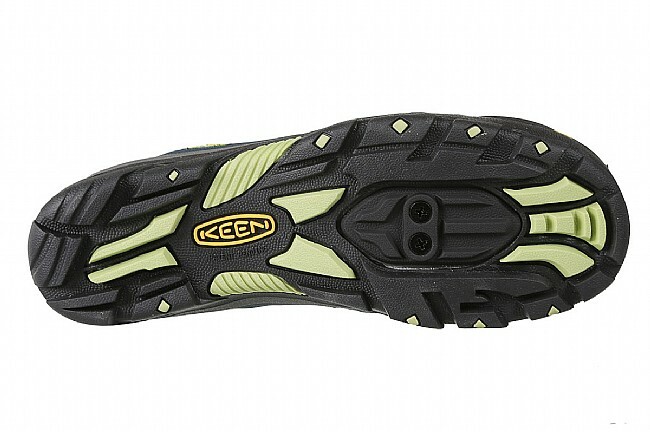 This hard-working bike shoe from Keen delivers dual functionality by doubling as a trail sandal. The non-marking rubber outsole provides the right grip on just about any surface, and highly breathable mesh uppers provide all day comfort. Unlike other sandals, they provide excellent toe-protection with Keen's patented reinforced toe box, and a bungee cinch system makes snugging down the fit a breeze. Features reflective accents on the tongue and heel pulls. Includes TPU sole cover for use without cleats installed. The Commuter 4 Cycling Sandal is available in multiple colors. 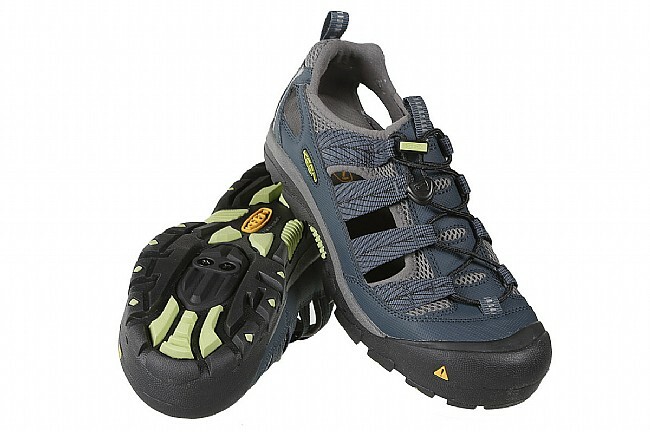 Love the Keen Commuter sandal!! Western Bikeworks prompt & efficient with my order. Really like it. Very comfortable. Only slight problem is the cleat hangs low enough to click and crackle on hard surfaces, and I don't dare wear it over my hardwood floor. 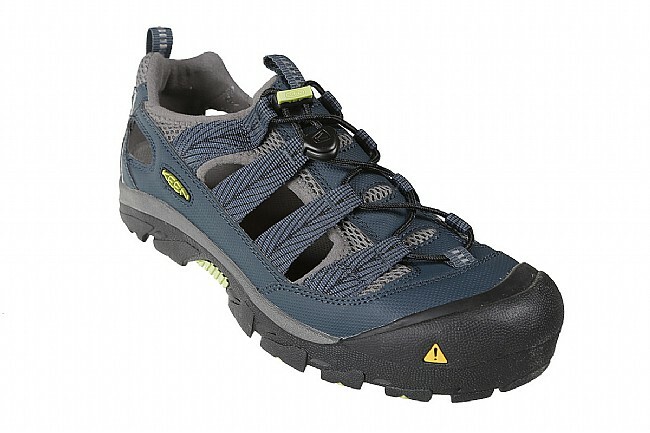 My Keen cycling sandal is the primary shoe I use for cycling. It can be adapted for clipless pedals, if that's your preference. Shoe fits nicely and is comfortable. There is one characteristic of this shoe that is a minor annoyance if you are not using it with clipless pedals the shoe slides, versus grips, one side of my pedals despite both having teeth. As long as I get the shoe and the pedal to match the grip is great, which means spinning the pedal around if they don't. So, if you are not attaching clips be sure your pedals have teeth! I would recommend this shoe. I've had this sandal before, so I wanted to get this type again once my other pair wore out. I was happy to find that you carried the sandal. I bought a pair last year for summer cycling and love them so much that I bought a second pair to keep at our place in Florida. This is my second pair and its the best shoe Ive ever had. Problems with hot feet during warm weather are gone as the shoes do not hold moisture. Problems with cold feet during cooler months are much improved as my feet sweat even in cool weather and then they get cold. Wear with showerspass socks or socks, toe warmers and booties. Great versatility and friends who have purchased on myrecimmendation have been very pleased as well. For the past five years I have happily biked in Keen sandals. They've been great, particularly on warm summer days. In the last few women's biking sandals have dropped off the market. I wanted to get a new pair and was pleasantly surprised to find this model on the Western site. They fit my medium width foot comfortably. Bought a half size larger for the right fit lenghtwise. Cleats were easy to install and are recessed enough not to screech when you walk on floors. No break in period. Good support without the shoe feel. Recently wore the new sandals with light wool socks on a cool day. Very comfortable on and off bike walking around. Not much sole cushion and ball of feet fatigued, so added additional insert and fixed problem. I had my 1st pair of KEEN COMMUTER CYCLING SANDALS for 8 years! I loved them and was sad when they finally needed to be replaced. I was hesitant at first with my purchase because they have changed the style a little bit. What I love about the new style is the more complete heel support. These keep my feet cool while riding , feel very secure & safe and are extremely comfortable . One of the best design parts is you can walk in them as easy as a regular shoe! I love them and I know you'll be happy with them too. love these shoes..Very comfortable and I ride with or without socks so its great when its hot. I have medium feet when it comes to width. Regular Keen's (although I love them) are often too wide for me. These are narrower and fit very comfortably. I wear 7.5 in normal shoes and 39 in Shimano cycling shoes. I got these in an 8. I might have been able to go down to a 7.5, but 8 is fine. I wear them barefoot for the most air flow. I primarily ride in spin class, but do recreational road rides on weekends. good for Short and long bicycle, 3 - 60 miles. Love my Keen cycling sandals! My husband and I have been wearing Keen cycling sandals since discovering them about 8 years ago. I have bought several traditional road bike shoes since then thinking I should wear them in colder weather. However, I always go back to my Keens - I just wear thick socks! I bought a pair of the Women's Commuter 4 sandals and have had them long enough to do a couple of metric centuries along with my shorter daily rides. Before I ordered them, I read reviews about how people who had the original style weren't happy with the newer style but I like them better! They're the perfect mix between a traditional road bike shoe and the original cycling sandal they came out with first. My husband wants a new pair now, too! My shoe size is a 7 but I went up a half size to a 7 12 and they fit perfectly. 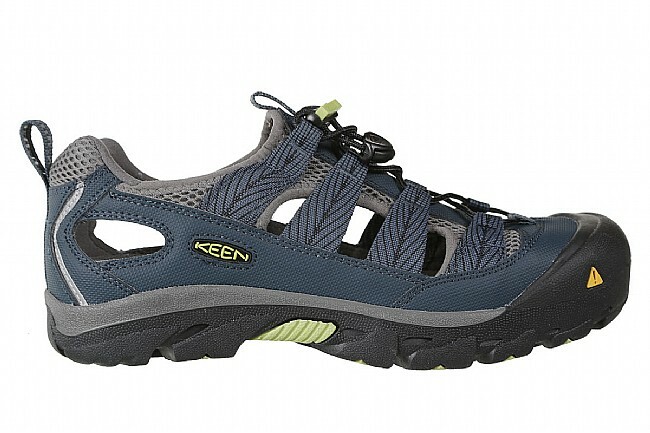 I'm not surprised that these Keen cycling sandals are comfortable on and off the bike. I ordered my normal Keen shoe size, and it fits perfectly. Although they look narrower than regular Keens, they don't feel it. It's a snug fit to slide my foot in, but it feels great on my foot cycling or walking. And they look good too! Great sandal with terrific stability! The right choice for warmer climates! The problem with these sandals is that they are shoes with holes in them, not sandals. The mesh is too thick for actual air to come through, leaving only a tiny bit of air circulation. When I wear them in weather over 55 degrees they feel like ovens. The point of getting sandals (or at least one of them) is to keep feet from getting too warm, and these fail miserably. They also have more of a shoe-like sole in the back rather than a strap that fits around your ankle, so every single step I take in these sandals they are sliding up and down the back of my heel. If you don't mind this sort of issue then the quality of materials is good and they have the usual Keens fit so not too narrow, which I appreciate. But NOT good for warm weather. Nice! They have holes so you can put the cleats on, if you have the snap in pedals (which i do!!!) and I LOVE THIS FEATURE!!! It doesnt really say this in the description and it should.. great selling point i say!!!!! The fit is for narrow feet. I had to return mine but my wife loves hers. The sizing is spot on, but if you had duck shaped feet, two sizes bigger to fit but the tires will be too big.